For nearly a decade, Big Box Retailers like Best Buy and Walmart have been aggressively pursuing mobile phone sales. At this point, smartphones make up a significant portion of revenue. To compete with eCommerce giants and carrier competitors, Big Box Retailers have been adopting strategies to optimize customer services both in store and online—all in an effort to boost customer loyalty. This means implementing omni-channel initiatives to make the buying process as simple as possible. Even still, retailers are lagging behind carriers in the smartphone market. And if you can’t maximize the number of customers coming in to purchase new smartphones, you miss out on much of the $17 billion used smartphone market. To take your mobile sales a step further, you should take advantage of the new smartphone frontier with an efficient mobile buyback program—it’s a unique opportunity to streamline your customer experience and generate more revenue. What Do Las Vegas and Smartphone Sales Have in Common? I remember walking around Las Vegas at one of the recent CTIA Super Mobility show. It was amazing to see the elaborate and costly infrastructure built right in the middle of a desert. Most of the bigger casino/hotels are complete with shops, restaurants, attractions and thousands of people—all of which got me thinking about the mobile phone market of all things. Las Vegas has an incredibly efficient way of attracting and retaining our money (especially when we’ve won money from the house). To win the secondary mobile market, Big Box Retailers have to think like Vegas. You have an opportunity to gain from your customers’ good fortune and new-found cash in the mobile trade-in process. 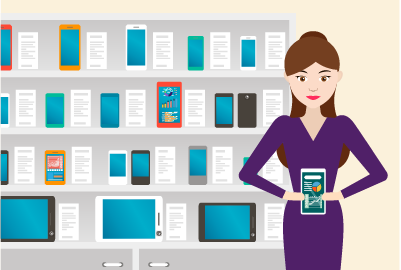 After processing more than 36 million smartphone transactions, we’ve found that less than 20% of consumers will sell their old phones at your store when they buy a new one. What happens to the remaining 80%? Some of these phones are sold online on sites like eBay and Amazon. Others are just given away to friends and family. But the majority of these devices end up being thrown in a drawer—losing value for weeks, months and years until they aren’t worth anything at all. Like Vegas, it’s your job to convince customers to sell their old phones to keep money in the smartphone system. It’s a lucrative opportunity for you and a winning scenario for customers who can apply that new-found money wherever they’d like. Consumers aren’t going to put up with friction in the smartphone-buying process anymore (just ask carriers). They can make purchases with just a few taps of the finger on their mobile devices—and they expect you to match this level of speed and convenience. Achieving expertise on a mobile platform appeals to the customers who are using smartphones in your retail environment. And the mobile buyback process is no exception, which has the added advantage of unlocking revenue for your business. Mobile trade-in technology helps customers trade their devices in at their peak value—a lucrative opportunity for you as well. Supporting Targeted Promotions: Identify a subscriber’s device and push notifications with alerts about his/her smartphone’s value. Promotions for new phones can be targeted at consumers who may have damaged phones. Accurately Assess Phone Value: Automatically identifying a phone’s model addresses a leading cause for inaccurate trade-in values. Make sure consumers are getting the right amount of money in their pockets to spend in your store. Self-Service Buybacks: Consumers don’t want intrusive sales processes anymore. Mobile trade-in technology lets customers go through buyback processes any time anywhere without having to go to your store. In the store, the technology can automate many of your trade-in processes to free up sales resources until a representative is necessary. These are just a few of the ways mobile trade-in technology can transform the retail experience. But if you want to learn more about streamlining buyback processes, download our free white paper, 15 Steps to Creating an Efficient Mobile Trade-in Program.